Keeping the car clean may seem like a difficult task, especially when you have to get rid of dirt and dust in the interior. Reaching underneath the seat can be too hard for most of us. No wonder, we would rather bring it to the nearest car wash than do the cleaning on your own! However, if you want to save money in the long run and keep your car clean, you need to invest in the right tools. Among others, one that you will need is the best vacuum cleaner for cars. If you are clueless on which one can provide the best bang for the buck and deliver exceptional performance, read on and we’ll provide you with a quick rundown of some of the top options available on the market. In my experience the best car vacuum cleaner will always be battery operated. 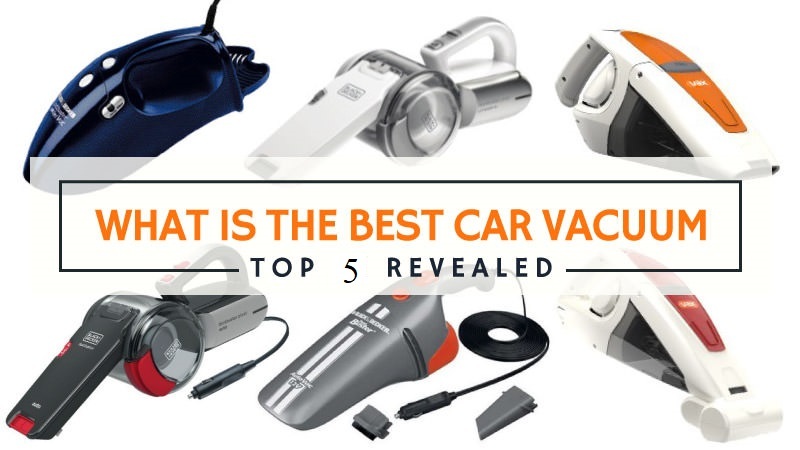 Which Is Best Car Vacuum Cleaner? Corded vs Cordless Car Vacuum Cleaners: Which One is Better? How To Choose The Best Vacuum Cleaner For Cars? How To Vacuum Your Car? Can You Use Car Vacuum Cleaner At Home? Here is a look at the brands and models vacuum cleaner for car and home that you might want to consider, as well as their outstanding features, which will make it easier to convince you that they will indeed be worth your money! This is a car vacuum cleaner that is made by a brand that is trusted globally, yet it comes with a price that is easy on the wallet, making it offer the best value for the money. Looking at its features, one thing that makes this exceptional is the lithium-ion battery. The latter allows the unit to deliver extended battery time. It is always ready, even when you do not use it for a long time. In fact, it is capable of holding a charge for up to 18 months. It is also a good thing that it comes with Smart Charge technology, which allows it to use less energy without compromising power. There is also a fast charging base, which will have the battery full-charged in approximately four hours. Meanwhile, with the cyclonic action, you can be confident that no traces of dirt will be left behind. It also comes with a bagless and translucent bowl, making it easy to see if it already needs to be emptied. Lastly, the manufacturer is offering a warranty that lasts for two years. Cheap at just under $50. Despite the small battery it still has very good power. May not perform well on fabrics. Suction power can be better. If you feel the need for a cheap cordless vacuum cleaner for your cars then I think you should consider it. Black and Decker CHV1410L have lightweight, has pretty good power and has the right tools for most cleaning needs. The best part is it isn’t too expensive plus you can bring it with you anywhere because it does not need a cord. 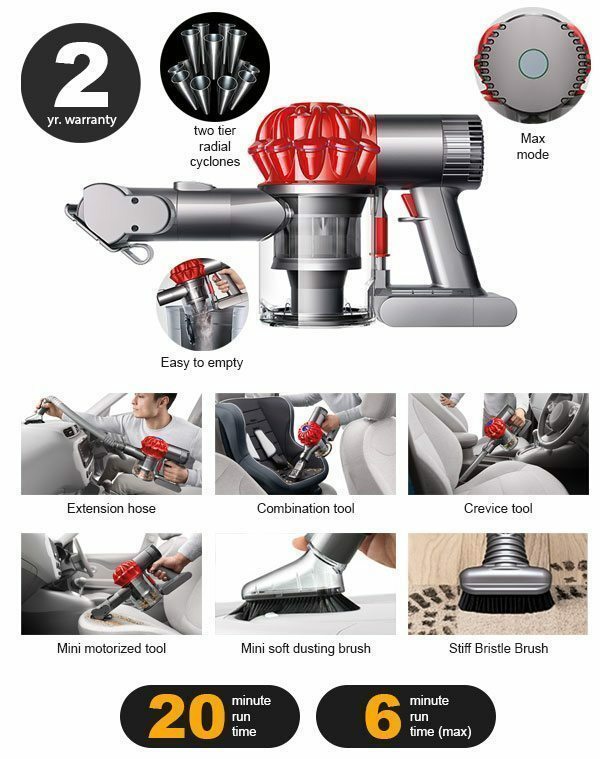 Dyson V6 Car + Boat is best handheld vacuum cleaner for car and home. The steep price of this product is one thing that most people would notice, but this should not discourage you from having it chosen over others. After all, it is made by Dyson. One of its biggest selling points is the Dyson digital motor, which is lightweight but powerful. This is the one that is responsible for its unrivaled performance. Meanwhile, with the 2-tier radial cyclones, there will be a parallel action to produce a more powerful airflow. This makes it a tough cleaning companion. For versatility, there are also cleaning tools that are included when you purchase the kit, which will include extension hose, crevice tool, combination tool, mini motorized tool, stubborn dirt brush, and mini soft dusting brush. It is also equipped with a lithium-ion battery that delivers fade-free suction. However, one of the problems is that because the motor is powerful, the battery can last only for 20 minutes when it is fully charged. Lastly, the manufacturer also offers a two-year warranty for parts and labor. Equipped with a powerful motor. Excellent suction for a handheld vacuum. Versatile toolset allows you to clean not just your car but also for home. Decent 20 minute run time. Lithium ion batteries ensure fade free power throughout the charge cycle. A lot of consumers were happy with how this handheld vacuum performed. What they said was pretty much consistent – strong suction, lightweight, cordless convenience and the ability to clean every nook and cranny inside a car. Don’t let the title “car and boat” limit the use of this hand vacuum – it is a versatile piece of machine that can clean above the floor areas and even spot areas on floors. You can purchase the extension want if you have high ceiling areas inside your home or for spot floor cleaning. You will love how the product comes with three attachments, which will make it offer cleaning versatility. It has a crevice tool, a dusting brush, and a liquid nozzle. Whether it is for dry or wet cleaning, this will prove to be a dependable product. The vacuum comes with a .6-liter container, which you can remove easily. It is also clear, making it easy to see how much dirt has been collected. Excellent for both wet and dry cleaning. This is the cheapest of the five products that are mentioned in this post, making it a top pick for those who are on a budget under $20. It comes with a 16-foot cord, which is long enough so that your movements will not be limited, even if you are far from where it is plugged. With a weight of less than four pounds, you will also love how it is lightweight, which means that you can clean for an extended period without easily complaining of discomfort. To provide a dependable cleaning power, this product is equipped with a 7-amp motor. At its price, this is decent enough. However, compared to most of the expensive options, this is definitely not as powerful. It also comes with a quick flip crevice tool, which makes it deliver versatile cleaning functions. Flip it in a snap and it will automatically convert into a crevice tool, which will come handy when you are cleaning tight spaces. Lastly, for your peace of mind, the manufacturer is offering a limited warranty that lasts for three years. Comes with a crevice tool. Produces quite a loud noise. Not as powerful as higher-end models. Dirt Devil Scorpion Hand Held Vacuum is very powerful and has excellent suction. Perfect for cleaning hard to reach areas like behind sofas and furniture with the enclosed hose attachment. The crevice tool is also good for cleaning sofa cushions. I like that it has a long cord and am very happy that I was able to purchase one that was not cordless. But i wish i see right now is that I wish it had come with one extra filter. I keep cleaning the filter after every use but definitely need to keep some extras on hand. I would definitely recommend this hand held vacuum. This is another corded option, similar to the product that has been mentioned above. It comes with an 18-foot power cord and a 2-foot hose. The curved carrying handle is also a great feature. This is known for its ergonomics, allowing you to position your hand in such a way that you can grip it comfortably. It also comes with a multi-level filtration, which will make it effective in getting rid of allergens in your car. This will be great if you have pets and kids. Also, similar to the vacuum cleaners that have been mentioned above, it also comes with a crevice tool that makes it a versatile cleaning equipment, especially when you are cleaning underneath the car seats. Lastly, the product comes with a one-year warranty from the manufacturer. The battery on this hand held vacuum lasts longer than do. Emptying the vacuum chamber is simple. Being able to leave the vacuum on the charger at all times without destroying the battery. May not be effective for hard surfaces. 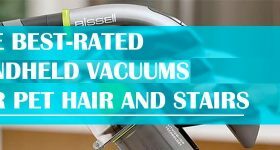 Bissell CleanView Deluxe Corded Handheld Vacuum is a great little vacuum. It does a great job sucking up stink bugs as they cling to leaves and straw and I can only imagine how great it would be at cleaning up stuff that doesn’t resist being sucked into it. Definitely a great purchase! Save Money: You do not need to pay someone to clean the interior of your car. It is one thing that you can easily do on your own, especially if you have the right vacuum cleaner. Improve Aesthetics: When dust and dirt accumulate, especially in the car seat and carpet, it makes the car look ugly. A vacuum cleaner can prevent this from happening. Get Rid of Allergens: Whether it is dust or pet hair, they can cause allergies especially amongst kids, which is why vacuuming is an important task. One of the first things that need to be decided upon would be the type of the car vacuum cleaner. You have to pick from corded or cordless. At the end of the day, this is one thing that all boils down to personal preferences. The best thing about cordless vacuum cleaners is that they are convenient. Since there are no cords, you can easily clean the interior of your car without thinking of wires that could get along the way. They use rechargeable batteries, so there is no need to think about the cord. The biggest selling point of corded vacuum cleaners, on the other hand, is that they are generally more powerful compared to their cordless counterparts. This will allow you to enjoy better suction power. If you will go for one that is cordless, see to it that there is a long power cord. Battery: If you are going to choose one that is cordless, make sure that it comes with an exceptional battery. It should take only a short time before the battery is charged and it should take a while before it is discharged. It should also offer fade-free suction to be a reliable cleaning companion. Cord Length: On the other hand, if you are going to choose a corded vacuum cleaner, you need to pick one that comes with a long cord, which means that you do not always need to be standing next to the plug or source of power. Weight: A lightweight car vacuum cleaner is always a better option, especially in terms of comfort. This will not make you easily feel exhausted. Power: Look at the motor of the unit and see to it that it can deliver powerful suction. It should be strong enough to not leave traces of dirt. While it is powerful, see to it as well that it will not make an annoying noise. Attachments: For versatility, choose a product that comes with bonus attachments, such as a crevice tool and a mini brush. Warranty: Within the warranty coverage, the manufacturer will offer free repair or replacement of damaged parts, depending on the terms and conditions that have been specified. The first thing that you have to do is to open the windows and the doors. Do not vacuum the car when they are closed. When they are open, there will be ventilation and you will be able to move freely, which will make the task a lot easier. Remove any visible dirt that you can see inside the car. Take out the floor mat as well. Now that your car is bare, start vacuuming. Use the soft brush attachment or the crevice tool, depending on what you are cleaning. Vacuum the floors, making sure to go underneath the seats. Vacuum the seats. Also, do not forget to vacuum the floor mats that you have taken out earlier. Now, use an appropriate attachment to also get rid of the dust on the dash. Finish by vacuuming the trunk. Bring back the floormats and you are done by now! Car vacuum is a DC device. Most household vacumms are AC devices that run on the 220v supply. First off, you will need to see how much current it draws at 12v DC. This is usually printed on a sticker on the vacuum itself. Once you know the ratings,you can start looking for a suitable power supply. These can be radio powersupplies, chargers for devices. If you dont have a DC powersupply, you can buy one of the appropriate specification. 12v DC / 2A if i have to guess. Second step will be to either cut the wires from the vacuum, from the cig lighter jack end and join it with the power supply keeping in mind the polarity. Alternatively you can buy a converter that does the same for you without the need for cutting the wires. This way you can use the vacuum in the as well as your house. Once all of this is done then just power it on and go bust the dust. P.S: Car vacumms are generally not powerful enough to be used as a household vaccum. Don’t expect spectacular results. In sum, if you have a car, might as well invest in the best vacuum cleaner. It will be an effective way to get rid of dirt and allergens, making it a safe place, especially for kids. The five products mentioned above will be your best bets, promising to offer the best value for the money! I’m looking to buy a vacuum cleaner for my car that will last a long time? I vacuum my car at least 4 times a week and I’m tired of paying at gas stations and different car washes. I’m looking to buy a vacuum cleaner that would clean my carpets nicely and get in to those hard to reach places. like the side of the seats stuff like that. Any ideas on what kinda vacuum I should buy something a detailer might use. I’m willing to pay up to 300 dollars for a resonable vacuum cleaner. We’ve looked different vacuums cleaners for car over more than 100 hours of research and testing in the past five years, and we think that the Black+Decker CHV1410L is a great choice for most people. With its flexible 4-foot hose and clip-on attachments, it can reach into spots around your home and car carpet that other vacuums can’t. Hello. I was looking for a good quality vacuum for my car clean. I’ve found your writing and read your information about the vacuum cleaner for cars. It’s very handy and got a ton of ideas from it. but can anybody help me with more information about car cleaner for vacuum website where I can buy the equipment from? Thanks! ?? Bissell CleanView Deluxe really provided me best result just because of reading your article so thanks for sharing this content with us. i was looking for the best result but did not get before utilized this to be honest it really provided me the best result ever.